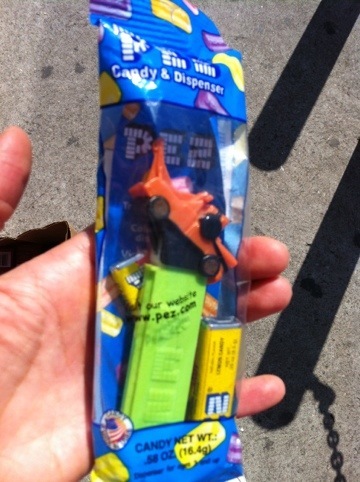 I remember (and had) Pez when I was small- even saw a TV show once with someone who collected them. Still made in the US, that’s pretty amazing. That brought to mind another product still made here. It’s a true classic recognized world wide for reliability and recognizable from it’s sound even if it’s not seen. A Zippo lighter. I actually have 2 of them even though I don’t smoke. Not really having bought much of anything over the weekend I don’t think I bought anything foreign. A battery charger I ordered online was delivered this Friday. It’s made in China and I knew that when placing the order. American manufacturers have to realize that if they don’t make products to meet consumer demand we will buy them from elsewhere. Apparently they don’t care as long as they can make a profit. I don’t know how the charger will hold up over time, and although I hate to say it, I really like what this charger can do. I have no doubt something at least as good or better could have been made here, and if it were I would have been willing to pay more to get it, so the question is ‘why wasn’t it’? I actually ended up buying very little last weekend. Had family visiting and spent my time with them at home, in the garden, hanging out. Makes me wonder, now that I think about it, how we choose to spend on the things we do. In February, following the lead of a popular blogger, the frugalista (www.thefrugalista.com), I tried to not buy anything that wasn’t truly necessary (although that could be open to wide interpretation). I consistently took my own lunch to work (which I’ve gotten out of the habit of unfortunately — time to get back to it), I brought all my water for the day to the office, and I steered clear of places that are cash magnets for me (e.g., Ikea — I’m a sucker for their cheaply made but often pretty cool looking stuff — Duane Reade, and the like). I’m glad that I live in a neighborhood that is not overrun by expensive coffee shops and nifty boutiques. I would be broke all the time, or at least thinking too frequently about things I do not need but would be convinced I did. It would be like running a constant infomercial in my face — the kind that attacks at 2 in the morning when you’re bleary eyed and insomniacal, and totally vulnerable to their well tested persuasion. Anyway, I considered doing a re-run of February because frankly it felt good to know I wasn’t spending cash just because I had it. (I rarely use credit cards, so I’m already practiced at avoiding plastic spending). It also felt good knowing I wasn’t contributing to a lot of paper waste. It’s pretty amazing to see how much unnecessary packaging there is on nearly every kind of product you can buy. I was happy to hear that California jumped on the plastic bag ban(dwagon) at the beginning of the month: http://plasticbagbanreport.com/. There is hope. for the Sport Berkey, a soft sided plastic water bottle with a built in water filter. A nice thing about it is you can refill it from a faucet or even water of questionable quality- and have safe drinking water pretty quick. I have yet to see any test results showing if it would clean up that dreaded yellow snow. I love this idea! I picked up something similar recently. Made in the US too. A few weeks of wear and so far it’s holding up well. I’ll post pics of that too. My only regret is not getting it sooner.